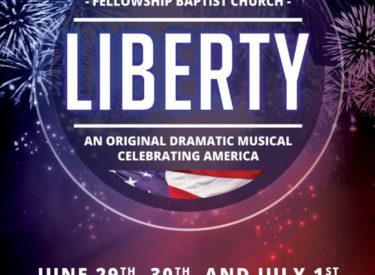 LIBERTY—the largest patriotic celebration in southwest Kansas—is back with a powerful and optimistic tale that is sure to inspire. Set in both the rural Great Plains and on the alluring Outer Banks, this original musical drama celebrates the splendor of America while honoring the unique patriotic contribution of every American. Utilizing a 60-voice choir and a 13-person cast, LIBERTY 2017 focuses on an Army pilot’s recovery from Post-Traumatic Stress while his Naval-officer girlfriend serves in the Persian Gulf. Overcome by images of the past, Bryan (Joel Knudsen) struggles to win his internal battle while anxiously awaiting Daniele’s (Melanie Lamas) potential return. LIBERTY 2017 is a patriotic epic that culminates in an inspirational and romantic finale. It honors everyone who has sacrificed for our freedom while stirring each of us to paint the portrait of an America more beautiful than ever before. Performances are June 29th, June 30th, and July 1st at 7:00 each evening at Fellowship Baptist Church, 310 W. Pancake, Liberal, KS. Seating is open, and admission is free! For more information, please call the church office at 624-7601 or visit www.facebook.com/liberty2K17.